Since last Saturday afternoon for 15-18 of 24 hours in a day I have slept due to some kind of virus. I blame the winter visitors who annually always bring some unwanted gift from Back East. The bad news is I lost almost five days. The good news is apparently I didn't have it as bad as some people who didn't get a flu shot, therefore I missed the grizzlier aspects of it. I'm determined to stay awake for the rest of the day with the help of pseudoephedrine and caffeine. 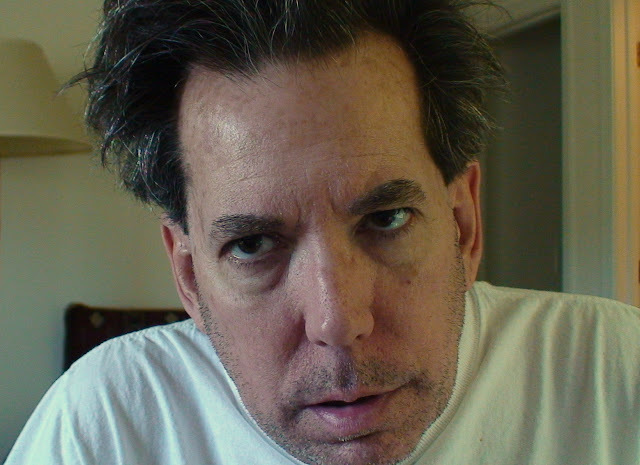 Since I can't share the offending microbe I will share the unedited version of an unshaven bedheaded me. On the lighter side the last time I succumbed to anything was early 2006 and when I recovered I had a burst of creativity. My mind is already cranking, photos and videos that need editing with stuff in my head that demands to be written. The flu is a very weird thing. I don't mean scientifically (I never understand that part of it) but mentally and unconsciously it is a very strange condition. I remember the last (and I think only) time I had the flu as an adult. It was, I think, 3 years ago and it was like...incredibly unpleasant and extremely painful at times, but also mind-clearing and creativity-enhancing, somehow. I distinctly remember lying there thinking how weird it was to NOT be thinking about anything else. If it hadn't seemed like something that was going to kill me, I'd welcome certain aspects of it back LOL. But about the creativity: it was (and I'd be interested in your take on this) almost like my mind was allowed to not worry about anything else for a while, and instead came up with these stories to (maybe) keep itself going while the rest of me was fighting bugs. It was interesting; I don't think I was consciously creating anything. It was more like I was being told stories. I wrote a couple of them down later (because they were memorable, surprisingly). It was weird and cool and interesting and if it never happens again I am definitely OK with it. Glad you're doing better, JR! Very astute observations about the flu. The last time I had it was in 2006 and this time I was sort of thinking along those same lines. I had been feeling a little less creative lately and all that time sleeping and waking with no reason not to somehow lubricated the mind in an odd way. I cam up with some good ideas and jotted the gist of them down. Oh and thanks for the "Casablanca" comment! Made me laugh.